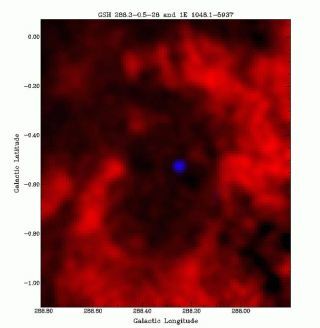 The red shows the neutral hydrogen gas mapped with CSIRO's Australia Telescope Compact Array and Parkes radio telescope, while the blue dot represents Chandra X-ray Observatory data showing the magnetar. The gas void around the magnetar is 110 by 75 light years wide. If a magnetar flew past Earth within 100,000 miles, the intense magnetic field of the exotic object would destroy the data on every credit card on the planet. This is not likely to happen, though, seeing as there are not many magnetars around. Recent research postulates that magnetars come from the death of very massive stars, which may mean that the dozen or so magnetars so far seen may be all our galaxy holds. "The source of these very powerful magnetic objects has been a mystery since the first one was discovered in 1998," said Bryan Gaensler from the Harvard-Smithsonian Center for Astrophysics. "Now, we think we have solved that mystery." Gaensler and his team investigated the gas around the magnetar called 1E 1048.1-5937, located 9,000 light-years away in the constellation Carina. They found evidence that the original star, out of which the magnetar formed, had a mass 30 to 40 times that of the Sun. "A star of that size is very rare," Gaensler said. Such a hefty beginning would help explain the difference between magnetars and their close cousins, pulsars. Pulsars are stellar corpses that serve as the radio lighthouses of the galaxy. Spinning around several times a second, they flash the galaxy with a beam of radio waves. Magnetars are similar, but they flash X-rays, and at a slower rate - about once every 10 seconds. They also occasionally let out a burst of gamma rays. There are about 1,500 known pulsars, but less than a dozen firmly identified magnetars. What makes magnetars special is their magnetic field, which is thousands of times stronger than that of normal pulsars and billions of times stronger than that of any magnet on Earth. "Magnetars have the highest magnetic fields in the universe - nothing else comes close," Gaensler said. These credit-card-erasing fields can be measured by observing how quickly the spin of the magnetar slows down. A rotating magnet gives off energy, and the greater the magnetic field, the faster the energy loss. Magnetars exhibit rapid deceleration, which implies a huge magnetic field. Gaensler has estimated that after 10,000 years a magnetar will slow down enough to turn off its X-ray flash. Magnetars and pulsars belong to a class of objects called neutron stars, which are big balls of tightly packed neutrons no larger than a big city. Here's how they form: When stars above about eight solar masses run out of fuel to burn, they explode in what is called a supernova. What remains can collapses into a neutron star. To have such large magnetic fields, magnetars are thought to originate from the supernova of very massive stars. Gaensler and his colleagues have found evidence for this in an enormous void - more than 70 light-years across - that showed up in their radio data. "The empty bubble is exactly centered on the magnetar and it is expanding," Gaensler said. He explained that the magnetar's radiation cannot be the cause of the cavity, since that would require the absorption of too many of the X-rays that are seen. Instead, a stellar wind from the progenitor star of the magnetar must have cleared out the gas. This wind would have been five times faster than the Sun's wind of charged particles -- the source of space weather and the Northern Lights -- and a million times denser. The implied energy is 25 million times that of our solar wind. In sweeping out the huge bubble around it, the heavy star blew off 2 to 3 solar masses of material. But even losing 10 percent of its mass in this way, the supernova remnant would have been too heavy to form a neutron star and would instead have collapsed into a black hole, theory holds. "Astronomers used to think that really massive stars formed black holes when they died," said Simon Johnston from the Australia Telescope National Facility. "But in the past few years we've realized that some of these stars could form pulsars, because they go on a rapid weight-loss program before they explode as supernovae." Gaensler said that, at the very end of its life, the star likely lost 90 percent of its mass, which would make it skinny enough to become a neutron star, as opposed to a black hole. It is possible from the wind bubble data to estimate that the supernova detonated about 3,000 years ago. Other magnetars are also thought to be a few thousand years old. "We do know these magnetars are an adolescent stage of neutron stars," said Jeremy Heyl from the University of British Columbia. Heyl was not involved in the work. If magnetars arise out of more massive stars, then only 10 percent of neutron stars will go through the magnetar stage - ruling out some theories that all pulsars spend some time as magnetars. The researchers estimate that in our galaxy there are only about 10 neutron stars from a massive enough progenitor and at the right age to be magnetars right now. There could be many more "dead" magnetars in the galaxy, however. Whether these results, which appear in an upcoming issue of Astrophysical Journal Letters, are the end of the story is too soon to say. "Right now, it is only one object that they have measured," Heyl said. "You can't make a very strong conclusion, but the hint is tantalizing."